﻿ April « 2015 « Haikasoru: Space Opera. Dark Fantasy. Hard Science. Thanks for all the entries! We set Intern Jackie to choose the winners, and this is what she had to say! The RED GIRLS giveaway winners! We got some lengthier entries this time. Pretty sure some of you are trying to put novels into the comments section. But what fun stories! Teri’s entry was clearly written, creepy, and humorous. I hope I’m never in a position where my coworker tells me it’s “my job to deal with kids and ghosts.” Good on you for reprimanding a pushy ghost, too! Ken, the ex-ghost hunter, drew us in with Will’s backstory and his descriptions of the gutted cabin. Ken’s entry should serve as ample warning to avoid old buildings that come with a story of a drowned child. I keep imagining the edge of that bathtub and the sloshing water. Eep! Tom McBride’s umbrella ghost story gave off a more subtle kind of creepiness. On cloudy days, beware a stranger smiling under an umbrella . . . Just how late do ghosts arrive, anyway? Finally, Andy Hendry, in addition to divulging how teens have (or at least used to have) fun in Wales, warns of a mountain where you should never camp—unless you want to hear giggling ghost children, that is. Thanks to all for your entries! Posted in Red Girls | Comments Off on The RED GIRLS winners! 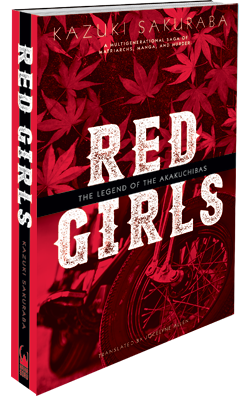 Red Girls deals with three generations of an illustrious family in post-war Japan, and contains at its heart a mystery—who was the victim of the murder a psychic grandmother confessed to? A pretty straightforward crim…wait, psychic? Yes. Red Girls won the Mystery Writers of Japan Award in 2007, but it is a supernatural mystery, a modern fantasy. Well, unless psychic powers are real, in which case the book on cinema box is not a fantasy. And that brings is to the theme of our giveaway contest! Ever experience anything supernatural or psychic or ghostly or weird? For real? For real real?! Tell us about it in the comments in a short essay. We’ll choose the four best winners on Friday April 17th, and noon, and will ship the winning books to you, no matter where you live, freeee! And feel free to submit in English, Spanish, Japanese, Chinese, German, or Greek. We’ll also take poems. So, Red Girls. Psychic phenomena. Fantasy or mystery. Tell us your mystic secrets and maybe you’ll win a free book!